Simple Letters Like This - NO Experience Required! - Just for writing a simple letter, like this one? It sounds crazy. But good “copywriters” earn more writing a simple letter like this than most doctors do in a month. Not only that, they set their own hours. They get to work from home. And they’re so in-demand, new job prospects are always knocking at their door. Being a “copywriter” is EASY. Even if you have absolutely NO writing experience, you could soon be churning out a simple sales letter every few weeks – and getting paid BIG as a result. Because I’m a professional copywriter. I know the TRUE SECRETS of the industry. And I’d like to share them. With YOU. Read About the Life of a Professional Copywriter! My name is Mel McIntyre – and I’d like to welcome you to my site! I’ve written sales copy for hundreds of e-mail marketing campaigns. I’ve helped create over 30 professional courses and e-books. And I’ve written DOZENS of sales letters that have brought in over $12 million in sales to the UK alone. Yes – I know a fair bit about copywriting. But here’s something MOST people don’t realize. I mean, it’s literally the SIMPLEST writing job around. There’s no writer’s block, no struggling to find your “muse,” no panicking because your books haven’t sold enough copies. When you discover the TRUE SECRETS of copywriting, you’ll discover just how amazingly simple it is. And best of all – copywriters are TRULY in demand! I mean, the work just never seems to dry up. Last year, in 2018, I had SO MUCH exciting work landing on my desk – I had to literally FORCE myself to take a holiday. Not only that, I also earned the MOST I’ve EVER grossed in my life. Can YOU imagine working in a “job” like that? Tap Into This $2.3 TRILLION DOLLAR Industry... Discover How YOU Can Earn a SHOCKING $10,000 Every Single Time You Decide to Write a Sales Letter! Let’s start from the beginning. What are "COPYWRITERS?" Copywriters are individuals that write content designed to persuade. I'm talking about press releases, marketing slogans, promotional articles. And, most profitably of all, sales letters. Sales letters a little like this one, for example. Now, take my word for it: This letter was EASY to write. I mean, it literally COULDN’T get any simpler. Yet most decent copywriters are paid a minimum of $10,000 (around £5,000) per letter. Want to build a magnificent extension onto your house? Just write a letter. Fancy taking your partner on a luxury cruise around the world? Just write a letter. How about funding your kids to attend a prestigious university? Just write a letter. By writing a mere handful of letters, many copywriters are earning $100,000… $200,000… $500,000… even MILLIONS of dollars per year… just for putting finger to keyboard. Not only that, many copywriters receive follow-up royalties on sales letters. So, in addition to getting their original fee, they could be claiming thousands of dollars in bonus income every month. For doing NOTHING! It’s a $2.3 TRILLION DOLLAR INDUSTRY that NEEDS people like YOU. But if it’s SO EASY, why isn’t EVERY writer doing it? Because they don't understand the UNWRITTEN RULES of copywriting. You see, there are a series of SECRETS to writing fantastic sales copy. Secrets that will enable you to throw away your day job – and become a permanent freelance copywriter. Secrets that will be the KEY to your financial freedom and happiness. And, TODAY, I’d like to share those secrets. Here’s the SECRET of Ernest Hemingway’s Popularity - And How You Can Use His Four Simple Guidelines To Help Write FANTASTIC Sales Copy, Every Time! Ernest Hemingway was one smart cookie. Okay, so he never wrote a sales letter. But he did know that the secret to writing fantastic copy is to KEEP IT SIMPLE. No fancy words or long sentences. Just PURE SIMPLICITY… Like you’d write in a letter to your mother. When Hemingway joined the Kansas City Star as a junior reporter, aged 18, he memorized its four simple style guidelines – and went on to spread them throughout the globe. Ernest Hemingway was no copywriter. But he couldn’t have put the core rules of copywriting down more succinctly. These are the base rules that allow ANY copywriter to write fantastic, compelling, EXCITING copy every single time – no matter how big the job. So… Could YOU write in a simple style, without complexity? Could YOU write a simple letter to your mother? Combine this “plain English” style of writing with the INSIDER SECRETS I’m going to share – and you’ll soon be writing POWERFUL sales letters (and press releases and articles!) that have companies BEGGING to hire you! I’ll show you how to write AWESOME sales copy that really sells. I’ll give you the SECRET two words you MUST include in every sales letter. I’ll even give you a “framework” for working, so you’ll NEVER feel stuck in your writing again! There are SECRETS to being a great copywriter. And STILL earning more than a handful of doctors combined – just for writing a couple-dozen letters every year. It was commissioned by one of the world’s most renowned copywriting companies, the Self Development Network Network – a company that turns over multiple of millions in sales every year, all as a result of its online copywriting. This fantastic new course shows you absolutely EVERYTHING you need to get started in the world of copywriting. You’ll learn the INSIDER SECRETS the REAL copywriters do NOT want you to know. You’ll learn how to GET STARTED with your first job as quickly as possible – and how to build up an AMAZING REPUTATION within just weeks. I’ll show you the FORMULA for writing amazing sales copy that works TIME and TIME AGAIN. You’ll be amazed by this – and you’ll NEVER be stuck for words again. I’ll also give you the CONTACTS you need for making yourself known to the industry. Within just a FEW short months, you’ll be able to leave your day job – and have companies BANGING on your door with fresh work! Plus, I’ll share the SECRET WRITING MARKETS that most copywriters completely forget about. Use these to your advantage. They’re a PERMANENT CASH COW… Just keep milking them for as long as you like! Please… Let me give you a SNEAK PREVIEW of what’s inside “The Ultimate Copywriter”! Are YOU Ready to Enjoy the Copywriter Lifestyle? Here’s a TINY SAMPLE of the SECRETS You’ll Discover Inside “The Ultimate Copywriter” Course! So, you’re ready to become a copywriter, huh? Here’s a SNEAK PREVIEW of just a few of the many, MANY master copywriting secrets you’ll uncover inside “The Ultimate Copywriter” course. Why your PORTFOLIO matters more than qualifications – And how to create a winning resume, even if you’ve never completed a writing job in your life! The TOP TIPS for EARNING MORE as a copywriter – And the calculations you need to figure out how to make it BIG in the writing world! The FOUR WAYS of getting started TODAY – And the bonus FOUR TECHNIQUES that every copywriter MUST know! The ONE SECRET METHOD of magically gaining the “STYLE” of the world’s best copywriters – This one is GOLD DUST! You absolutely CANNOT MISS THIS ONE!! The FOUR DON’TS that you absolutely MUST NOT DO in your career as a copywriter. Get this wrong and you might as well not bother starting! How to BREAK into copywriting for the WEB – And the SIX-PART TECHNIQUE for ensuring you beat the system! The SIX ONLINE ORGANIZATIONS that you MUST know to keep up-to-date with the world of copywriting. Don’t fall behind with the masses! How to WRITE as you SPEAK for MAXIMUM effectiveness – Discover what’s wrong with this technique, and how to get it RIGHT! The HEMINGWAY SECRETS – Discover what else he learned at his six months at the Kansas City Star, and how it impacts your copywriting! The THREE SIMPLE METHODS of writing powerful copy that COMMUNICATES – You won’t believe how easy these are! The FIFTEEN STEPS of a MAGICAL SALES LETTER – Just fill in the blanks to enjoy the PERFECT sales letter. It doesn’t get any easier than this! The POWER of LISTS, just like this one! – And using them to make someone RUSH to purchase your client’s products. Which means more cash for you! Read my STEP-BY-STEP ANALYSIS of one of the most POWERFUL sales letters on the Web TODAY – And learn from its HIDDEN SECRETS! Uncover the TWO MOST IMPORTANT WORDS you absolutely MUST include in every sales letter you write! Why the MAJORITY of sales letters FAIL – And how to stop this from EVER happening to you! The SECRETS of writing a sales letter that rakes in CASH, for YEARS after you’ve written it! The Power of the “USP” – And why you MUST identify this first, otherwise your sales copy will be as wet as the ocean itself! Alternative ways to earn BIG MONEY from your copywriting skills – Including press releases, slogans, articles and more! The SEVEN-STEP press release formula – Just follow this to write your press release and rake in easy money during your lunch break! Individual GUIDES for writing everything from Web page content, to corporation mottos, to magazine features! The BIG BUCKS to be earned in professional “SEO” writing – And the mistake that 99% of copywriters make when writing SEO articles! The SEVEN LUCKY SITES for developing your copywriting business. If you don’t bookmark these, you’re losing out! The FOUR BIGGEST COPYWRITING JOB SITES on the Internet today – Register with these and get ready for the offers flooding in! The EXACT STEPS to promoting yourself in the industry – And earning more cash than you ever dreamed possible! How you can GET PUBLISHED, earn more money than you’ve ever dreamed of – AND spend more time at home, with your family! How to get FRESH JOBS landing in your Inbox every single day – WITHOUT having to go chasing for them! How to begin enjoying the UNLIMITED EARNING POTENTIAL of a copywriter – beating doctors, politicians and actors! How to tap into your COPYWRITING FAME to write your own BOOK – Copywriting is the perfect stepping stone to getting your book published! A QUICK and SIMPLE WAY to spot BAD COPY quickly – And how to turn the errors of other people into a money-making goldmine! The EIGHT STEP-BY-STEP copywriting solution “cheat sheets” – Print these pages out and you’ll NEVER be stuck for words again! This is everything you need to know to make it BIG in copywriting. And MORE. Are you ready to discover ALL of these secrets? - PLUS: Check Out Our 100% NO-RISK Guarantee! Are YOU ready to become a professional copywriter, the EASY WAY? Excited about enjoying the HUGE earning potential – and casual, laid-back LIFESTYLE? 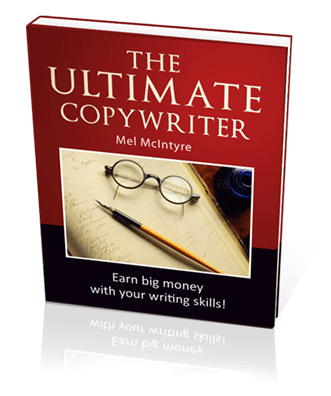 Then you need to discover ALL of the secrets crammed inside “The Ultimate Copywriter” – TODAY. It’s an accumulation of YEARS of work in the industry, the INSIDER TRICKS that nobody else wants you to know. All fully unveiled – for the very first time, EVER. So, how can you grab YOUR copy of “The Ultimate Copywriter”? This 180+ page course is ONLY available from this website, at www.mycopywritingcareer.com. And for a limited period only, you can order YOUR copy for the TINY price of JUST $97. SPECIAL OFFER: Buy the entire course during April for JUST $47.95! That’s the lowest price we’ve EVER offered the entire “Ultimate Copywriter” course. You’re unlikely to find a professional copywriter willing to give you even 10 minutes of his time for that price. first year of part-time copywriting. and we’ll refund your ENTIRE purchase cost. won’t deduct any S&H or restocking fees. You’ll get EVERY PENNY BACK. The guarantee is backed up by the Self Development Network Network too, so you know your money is in safe hands. So, would YOU like to try out the entire course, RISK-FREE, for an entire year? Please read our earnings & income disclaimer. “Yes! I Want YOU to Be a Copywriting Success Story!” Grab YOUR Copy of the Entire Course TODAY And Claim FOUR HUGE Bonuses, Worth Over $300! Let me tell you something: I want you to be a SUCCESS. When you make it big, it’s a win-win situation. I get to keep your course dollars. And you get the copywriting lifestyle that is perfect for you. That’s why I’ve taken everything one step further. Instead of JUST giving you the basic course, I’ve compiled FOUR MASSIVE BONUSES to help you succeed. Separately, they sell for over $340. But they’re YOURS, absolutely FREE of charge – when you decide to purchase YOUR copy of “The Ultimate Copywriter” BEFORE midnight, Thursday. Yes, you MUST act fast. “The Top TEN Sales Letters of All Time” – Discover the ten little-known sales letters that generated BILLIONS of dollars in revenue. See how simple they are constructed – and read my step-by-step ANALYSIS of their powerful yet “hidden” sales techniques. This is perhaps the most valuable “bonus gift” you’ll EVER receive! Absolutely PRICELESS. Learn from the masters! “Power Copywriting for the Internet” – Master copywriter Bob Serling shows you how to write million-dollar advertising copy, using his own powerful 32-step formula. Almost 150 pages of online copywriting secrets, from the undisputed King of Copy! Interviews with FIVE Million-Dollar Copywriting Pros – When you want the best advice, go to the best in the industry! We’ve purchased the rights to interviews with the TOP FIVE copywriters in the industry, each having made millions in sales with their words. Includes interviews with JOE VITALE, Marlon Sanders, Audri Lanford, Declan Dunn, and the late Corey Rudl. “How to QUICKLY & SAFELY Change Careers” – Want to enjoy life as a full-time copywriter? This 25+ page guide will show you EXACTLY how to go about it – without risking a single dime. Includes a bonus “Roadmap to Success” to ensure you hit the big time, with nothing at risk, and everything to gain! Individually, these gifts retail for well OVER $300. And, when you order before midnight, they’re YOURS – at NO extra cost. - Hale Carlton, author of "The Meditation Program"
You’re FIVE MINUTES Away from a New Career! Grab Our ENTIRE COURSE with FOUR Bonuses TODAY! ... All of this for the TINY PRICE of JUST $47.95. It’s midday – and the warm sun slowly wakes you from a beautiful, deep sleep. For a few moments, you enjoy the silence, and think of the day ahead. You’re having lunch with friends at 2pm. It’ll be nice to catch up again. Of course, the kids are home by 4pm. Time to have a little family fun! And not forgetting your spouse. You’re booked in to enjoy a champagne dinner at that new exclusive restaurant in town tonight. Remember? It’s vacation time soon, too. Then you remember the Ultimate Copywriter website. And how thankful you are that you decided to take that “risk” – and try out the course. Begin your new future TODAY. Thanks for taking the time to read my simple sales letter. PS. There’s NEVER been a better time to get started in the world of copywriting! The industry is DESPERATE for new talent. Few writers really know how to write copy that SELLS. Now is YOUR chance to learn. Click HERE to grab your copy of the course! PPS. 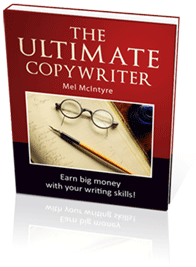 “The Ultimate Copywriter” is ONLY available from this website! You cannot purchase this course in stores, from eBay, or anywhere else online. If you want to try your chances at being a copywriter, you MUST order the course from this site. Click HERE to get started! PPPS. Remember, we’ve absolutely NEVER offered “The Ultimate Copywriter” package at such a low price before. So if you’re even REMOTELY interested in copywriting – even if you think you’re going to send the course back after extracting its secrets! – then grab YOUR copy, TODAY.